In recent years there has been an upsurge of interest in Turkey's ability to create a secular, constitutional democracy within a predominantly Muslim population. Remaking Turkey provides a comprehensive and detailed account of how Turkey has achieved the possibility of modernity and democracy in a Muslim social setting, as well as the important problems and challenges confronting this achievement. Turkey has demonstrated that, as an alternative modernity and a significant historical experience of the coexistence between Islam and democratic modernity in a secular political structure, it could make an important contribution to the most needed democratic global governance for the creation of a secure, just, and peaceful world. Remaking Turkey starts its investigation with an analysis of the Ottoman legacy, then proceeds by focusing on identity-based conflicts and civil, economic, and global processes, each of which have brought about significant challenges to modernity and democracy in Turkey. 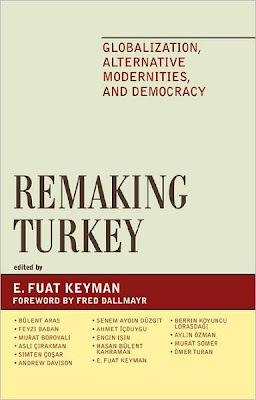 It concludes with an account of the recent changes and transformations that have given rise to the process of "remaking Turkey." In this way, editor E. Fuat Keyman presents a political theory-based approach to Turkish modernity and its recent changing formation, creating an original study of contemporary Turkey.